Many people use herbal remedies for mood swings and a wide range of medical complaints. Although a large number of remedies are not substantiated by scientific research, people continue to take them, and some find them beneficial. If mood swings or another condition is having a negative impact on your life you may want to try out herbal remedies, which are one form of treatment for mood swings. However, keep reading to learn about herbal remedies that can help with mood swings. Many people find it helpful to keep a daily journal. While this can be time consuming and emotionally draining on occasion, in the long run it will help you to explore how you feel and why you feel that way. By keeping track of a journal you may be able to see if something, such as alcohol or caffeine, is triggering your mood swings. Mood swings can also be caused by hormone changes during the menstrual cycle. Keeping track of these things will help you better understand your own body. What Kind of Herbal Remedies are Available? Chamomile. Research has shown that chamomile tea has relaxing properties. Chamomile, and herbal teas in general, provide a healthy alternative to drinking black tea and coffee, which contain caffeine that can trigger mood swings. Even the act of sitting down to drink a cup of chamomile tea gives you time to relax and clear your head, which can help control mood swings. Ginger. Ginger, while not traditionally used to treat mood swings, can be used to relief general nausea and upset stomach that can be sometimes felt along with severe mood swings and anxiety. Ginger has a sharp flavor that can help clear your senses. Authentic ginger ale also contains ginger. Drinking ginger ale in place of alcohol when you go out can help prevent mood swings if alcohol is a trigger for you. Oral contraceptive. While not an herb, oral contraceptives contain estrogen and progestin, which can help treat mood swings and other emotional changes caused by hormonal changes. Taking a low dose will provide you with steady hormones, which can prevent mood swings triggered by hormone changes. 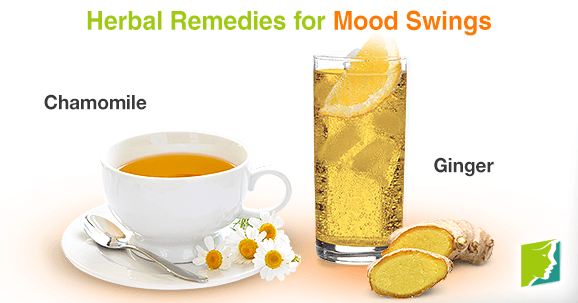 Why Use an Herbal Remedy to Treat Mood Swings? While not always effective, herbal remedies often benefit from the placebo effect. This is when an ineffective medicine helps someone, not because it contains helpful properties, but because the person taking it believes it will help. It's important to talk to your doctor before you start taking oral contraceptives or any form of herbal supplement. Herbal supplements, especially when they are taken in high doses and concentrations that are not usually found in nature, can cause side effects and interact with medication. Herbal remedies can help some people, but it is important to make sure you also have a healthy lifestyle. This can include having a balanced diet, exercising regularly, and seeing a therapist if need be in order to address any underlying causes of mood swings and effectively treat mood swings. Don't let mood swings get you down. Although it may seem that your negative emotions are out of your control, exercise can help control them.